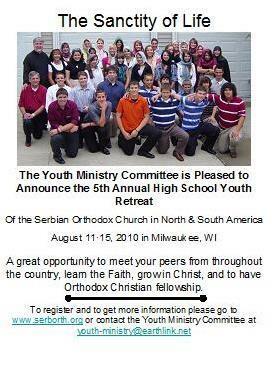 Milwaukee, WI - With the blessing of the Episcopal Council of the Serbian Orthodox Church in North and South America, the Youth Ministry Committee of the Central Church Council of the United States and Canada is pleased to announce the Fifth Annual Youth Retreat to be held in Milwaukee, WI from Wednesday, August 11 through Sunday, August 15,2010. The theme of this year’s retreat is “The Sanctity of Life.” The retreat is open to high school students. Students are eligible from the summer prior to 9th grade through the summer following 12th grade. Download registration materials for the retreat here. For further questions email the Youth Ministry Committee at youth-ministry@earthlink.net.